At Historical Emporium, we have been selling authentic period clothing since 2003, with thousands of satisfied customers around the world. We have sold hundreds of goggles, and we listen closely to customer feedback to make sure we're delivering on the promise of unique, authentic clothing, world class service, and great prices. We survey every customer to gauge their opinion of the products they bought, and put together this list of the top-ranked goggles in our store. Shop with confidence, knowing that these terrific goggles have been tested and endorsed by our other customers, and that you will receive five star service along with a great value! Comfortable. Can wear over my prescription glasses. 5***** Fit perfect and looked great! Good quality materials! Just what I was looking for for a costume. The shipping was fast as well! Just what we were looking for. Speedy service. You guys are the best. 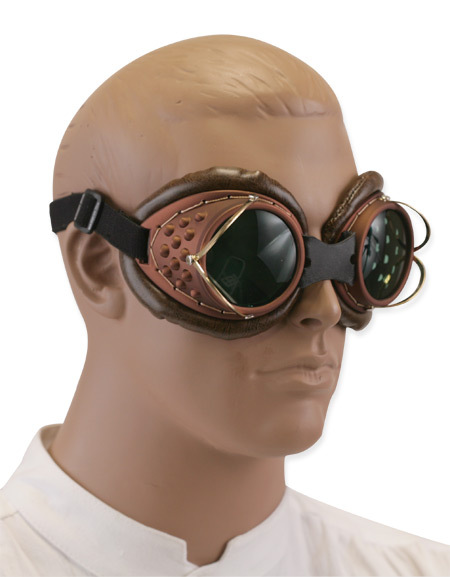 Got the goggles for my Steam-Punk 11-year-old. He never takes them off! If he's a happy chappy, so am I. Thanks! After looking around I decided to give these a try. Reasonably priced and a quality item for the price. Not top notch, but price reflects that. Absoluty happy with them! These are JUST what I was looking for. Very authentic, and really cool to wear. I guarantee...You'll look good in these goggles. excellent look. head turner when worn over ski helmet.. loved it. Great price. a realy good poduct and i would recamend a very stylish product. Very cool looking, with the faux rivets around the lens. Got lots of complements. However I also found roughly the same thing on Amazon for less. 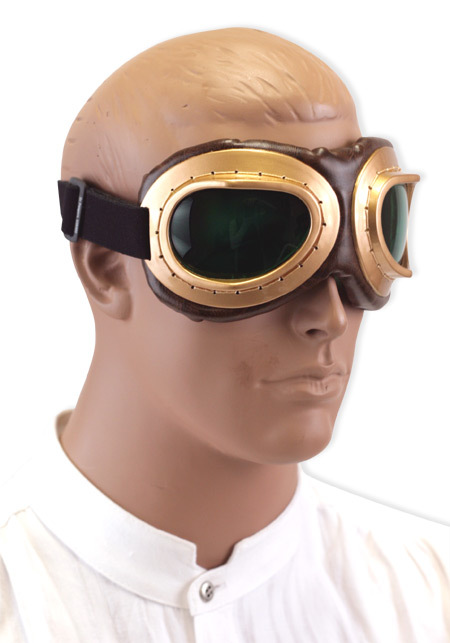 The intricate detail and gold lenses give these goggles a high end steam punk look. Much better look and quality than the cheaper goggles. Brought these for my Sons, he LOVES them. Very well made and the both look great and feel comfortable too. Only wish the strap was leather, that would make it perfect. I love these! They're even better in person than they look from the picture. Definitely a winner! Well made, but exactly what they are advertised to be. 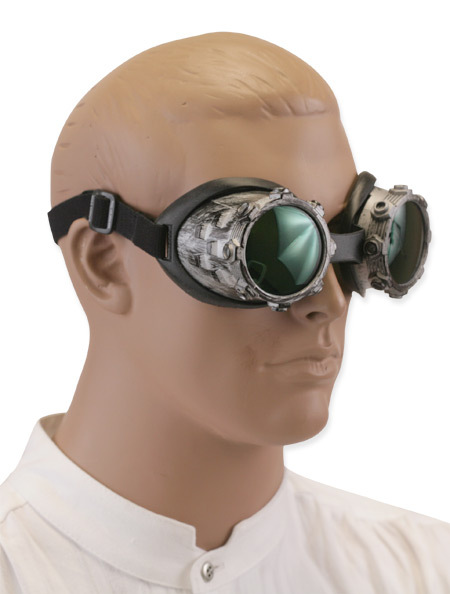 Steampunk style googles. They look great with my maroon duster! Steam Punk Must. The red lenses really pop. Everyone wanted to know where I got them!!!! I purchased these for my sons 14 th birthday and he absolutely loves them!!! I really like the quality of the material and you can't beat the price! He is planning on doing some more shopping here very soon! Oh and what your delivery time stated was 8 days and I received them in three! WOW!!! Ordered my goggles not too long ago and shipping was fast. Every time I wear them I get compliments. These goggles are fantastic. We have an old time photo business (Shady Lady Old Time Photos) in Guthrie, Oklahoma and are adding Steampunk as one of our photo options. We currently do Old West and Victorian. We are excited to have found the emporium and will be ordering more in the near future. Thanks for the prompt delivery. 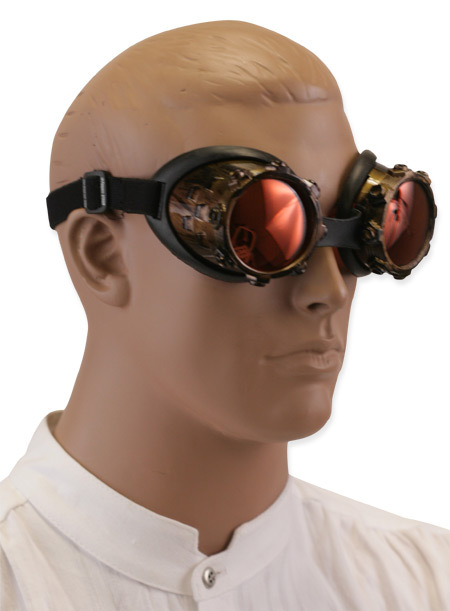 Let's face it, Steampunky-Goggles are a dime a dozen, and finding ones that are unique can be a challenge. Through my travels on the great uncharted internets, I was unable to find a copy of such a pair, and I am pleased that the Emporium sought to rectify this! 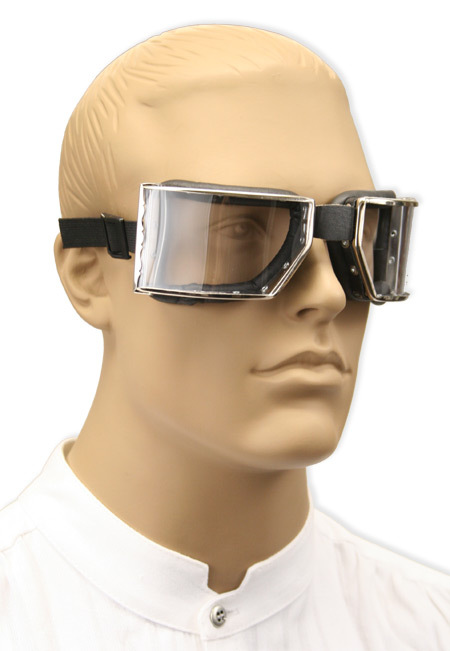 The style is amazing, the goggles are of above-average quality, and very comfortable once adjusted correctly. I highly recommend them! Very goo quality. If you want something different, buy them. Got what I expected, I love them, received them promptly! Arrived two days after I ordered them. Very comfortable. Works very weel with the look my wife and I are trying to create. These goggles are totally awesome! I bought them for a friend for Christmas, and when they arrived, I honestly debated if I was going to give 'em up. Needless to say my friend absolutely adores them also. He barely ever takes them off! The quality is awesome, especially for the price, and they arrived in, like, three days. I am VERY satisfied with the product and service. I'm definitely buying from here again. I bought these for a Halloween costume and got several compliments on the googles. I thought they were well made and well worth the cost. The shipping and processing was superb. They fit great and feel comfortable. There was a hair thin scratch on the inside rim on the exterior of the goggles. It's only visible at super close distances, ad doesn't even warrant a return on my part due to the overall quality of the rest of the piece. Overall, I am very satisfied with this product. It is very well put-together. The only complaints I can honestly say I have about it are the elastic headband and the plastic bits. It detracts ever so slightly from the feel of the product, but it still looks very nice and I plan on modifying them anyways. Very comfortable and well made. These goggles are comfortable and fit my eyeholes nicely. The rear strap and size adjusters are seriously flawed, cheap plastic clips do not hold elastic tight and are unusable without some repair. If you are slightly crafty you can figure out a solution, mine work fine with two safety pins holding elastic together. The metal is thin and light in a good way, although I am careful not to bend the rings when changing lenses. My custom lenses fit perfectly in these goggles, magnets stick to 'em! I love these goggles. They have a nice authentic feel to them and I've made them a part of multiple costume ideas so far. A quibble with the band though, it seems to be geared toward smaller heads (which I do not have) and the adjustment clips on the side don't hold the strap very tightly, so I did have it fly off at one point. Not a huge deal, as I stuck a pin in to keep everything together and they remained comfortable, but I found it worth mentioning. I mean, who doesn't want some goggles? These are great. They ruin your peripheral vision, but that's to be expected. The lenses are lightly darkened, but not in any way that helps you deal with the sun; these don't stand in for sunglasses. They are a comforting aluminum that clinks metallically and and has some heft, while still being lightweight. The lenses are just a bit recessed past the edge of the frame (I'm not sure how they might unscrew; everything looks riveted together). Unless there's light shining in on your eyes, the lenses keep your eyes pretty shaded and hidden. I found the strap to be a little small, and the straps have a tendency to slip out of their...strap holder thing. Maybe I just have a big head. But it was easy to set them so that they were comfortable on my face and forehead. I want to wear them all the time. A little pricey for what the are. A little pricey for what the are. cheaper on ebay, but I bought them last minute & I needed them fast. one good thing is your fast shipping. They worked out ok but the straps kept coming loose until I tied a knot in them. These are actual working cutting goggles meant for use in the lab or workshop, not the plastic stage props sold elsewhere! Just blacken the inside with a marker to cut glare and you're ready to go. Nice goggles, but the strap and the strap tighteners are notably chintzy. The goggles themselves are fantastic. 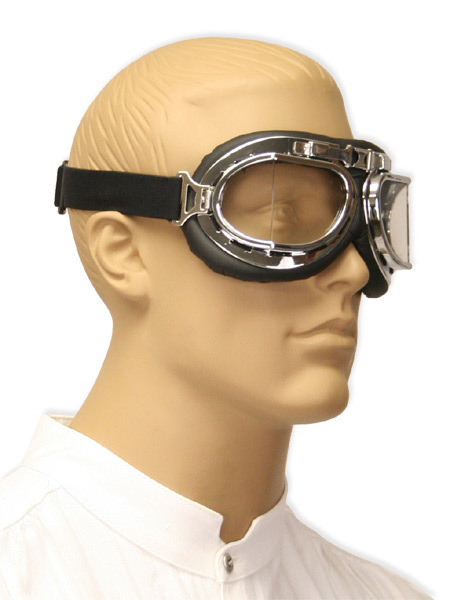 I searched around for goggles and while some were cheaper and not as decorative, I had the preference for the leather bridge and padded leather eyecups on this one. I made sure I got the clear replacement (plastic) lenses for the evening parties (don't forget this!). Perfect for my minion costume and future steampunk wear. I took one star off because the plastic clip that holds the adjustable elastic headstrap will easily slip off from all the constant tugging during wear. I wish there was a more secure way to keep this on. Losing that clip would be a party pooper. The goggles are great looking and I love them...mostly. Get some better straps for these puppies (the ones that came with are flimsy and undependable) and they will be the perfect accent for any steampunk adventure. These goggles look amazing and feel lighter than you might expect. I'm not sure that my husband should be using them as protective goggles while he does his real "mad science" but he does. Highly recommended. 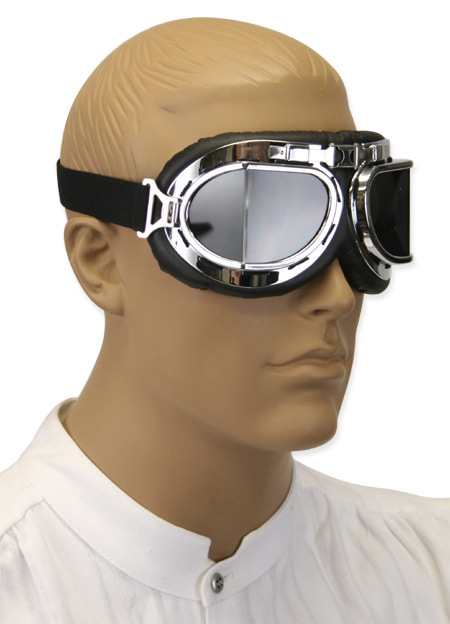 These goggles are well padded and comfortable to wear, they seem well constructed too. The lenses are easily changed out, but secure when screwed down. The elastic band they came with could stand to be a little longer, it kept pulling out of the buckles. I replaced it with a strip of upholstery leather, now they stay on fine. All in all, I am pleased with them. This Googles will change your view of the world. My steam punk group, TEOS (Temporal Entities of Syracuse), had a booth at a local horror convention. We were acting as staff and promoting our group. I wore the Screw Ring Goggles  and Mad Scientist Howie Lab Coat - Red . I got tons of compliments and many people asked to have their photo with me. The customer service people were very helpful when I queried about getting prescription lenses in these. While the adjustable strap is a bit fidgety, it can be worked with, and that weekend I had the techs at LensCrafters fighting over who was going to put custom lenses in. They look great and fit great. These are fabulous goggles. Fun look. these goggles are really neat. they really make a wild impression for such a rare design. I've always been a big fan of ww 1 aircraft and anything associated with them. also, they are very comfortable and fun to wear around even if you don't have your own airplane. they also make a good impression when worn on military helmets. my only criticism would be that the center piece between the lens should be a bit stronger. it should be made of a thicker leather that will not split under stress. that being said, I still like them well enough that I may get an extra pair at some point in the future. These things are great. In fairness, if you are used to the old split-lens, puffy-padded "Red Baron" goggles (which I have worn for years) they seem somewhat insubstantial, but that is their beauty. These are a slim-lined, light-weight pieces of kit that are functional and look bloody brilliant. Neat and precise. I'm very happy with my purchase. These are as pictured but are made of very cheap materials and quite over priced for the quality. loved the goggles, displayed them on aviator cap. What these needed was the perfect head gear, so I purchased the British Pith Helmet…perfect combination. As always shipping was fast, another great trade. Great deal/look cool. Every cool motorcyclist should have a pair!... of these sunglasses. I'm sad that the goggles aren't comfortable at all over my regular glasses! They actually press my glasses painfully into the bridge of my nose. Perhaps I can survive for short bursts of wearing them as my wife and I drive up to local destinations in our 50's Super 7 Roadster... They add quite a visual flair to the Faux Aviator Helmets we also purchased and look great for the purpose. The product arrived in a timely manner and the quality of the item exceeded my expectations. These things are funky and cool. They make me wish I had a WWII Harley or Indian motorcycle that I could ride to my hangar where I keep my bi-plane. They complete my steam punk outfit perfectly. nice item, well made and functional. great fit with reasonable peripheal vision. worthy price point. customer service and shipping is excellent. 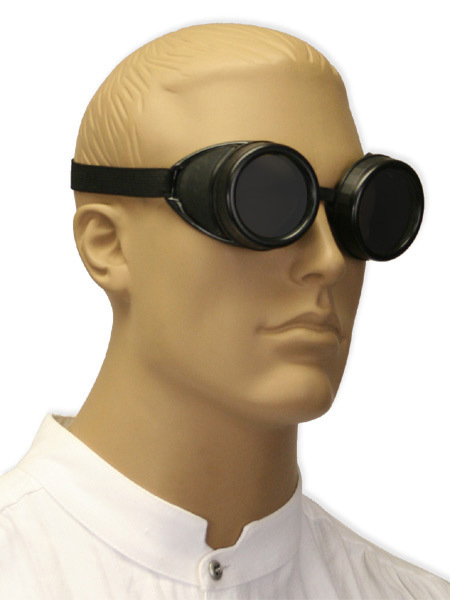 This was an excellent purchase, the goggles are both stylish and highly functional. Lenses do not limit vision to the sides of your head, and fit very comfortably. Delivery was timely and easy to track. An excellent purchase. These are worth every penny. Beautiful and my girlfriend won't take them off... Comfortable, too! I didn't quite know what to expect, especially given how affordable these goggles were, but the quality is really impressive. The strap, is great, doesn't seem flimsy at all. The goggles have a green tint to the lenses when you are wearing them properly, but look completely black from the outside. They just look amazing, Cant wait to wear them out and about. Just what I was looking for! The price was great and the quality was excellent! Great product and price. Quality glass interchangeable lenses. 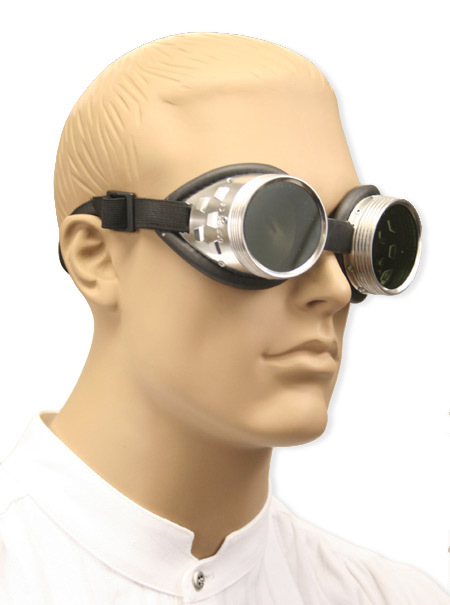 These goggles are a good value, and best for accomplishing the "look". If you're hoping to drive a model T with them, choose another pair. These goggles are delicate. The elastic band becomes detached very easily. I was able to fix them satisfactorily with safety pins. Perfect starter goggles! I'm putting together my first steampunk costume and these are a great finishing touch. With a little primer, copper paint and an assortment of old watch gears glued on they look fantastic. The replacement lenses I ordered add an extra touch of style. Shipped quickly, as all of my orders have been. Love these!! I receive many compliments on them. The goggles were delivered quickly; they are exactly what my daughter was looking for. Price was very reasonable as well. A BIG Bang for your Buck! These are really a nice pair of goggles at their price point. They are easy to paint, assemble and dis-assemble for any needs you require of them, and the Vent Caps actually pop off, giving you the option for peripheral vision. I did have some issues, however- the nose bridge band is difficult to adjust, and the nose pads dig into one's head if you wear them up there for a few hours. Other than that ( which is to be expected with non-custom, under $20 plastic goggles) I could not be happier with my purchase. You should also pick up a set of color lenses- they really set your goggles apart from the standard fare! Nothing says I'm a total badass more then a good pair of authentic looking welding goggles. These fit nicely, look dashing on my top hat, and adds that extra bit of class to any steam punk look. Would I recommend? Indeed I would. These worked so great for Fester in The Addams Family play - very authentic looking and a fantastic price. Shipped very quickly as well. Thank you! Goggles are great. Was caught in the rain after participating in the Distinguished Gentleman's Ride in Evansville, IN. Besides looking cool, they served their purpose. Well made, nice style and functional. Decent price. Got these and they are so cool and my sister fell right in love with them I rode up on my Drifter 800 in my Canvas trench coat and guantlets and the goggles over my eyes......she laughed so hard she cried. She now has the goggles as she is undergoing chemo so that things will look brighter for after it is over....thnaks for an awesome place to shop and to buy "stuff"
These don't seem like they'd be sturdy enough if someone wanted to use them to ride a motorcycle or anything, but for appearances sake they are just fine. The strap in the back is adjustable and I can't imagine the kind of head this wouldn't fit. I bought these because they're funny looking and I could also use them at work. They are good enough as far as I can see. They have a green tinted lens. The only complaint I have is that no matter how I adjusted the headband they pushed divots into my face. I think a bit more padding around the rim would make them more comfortable. I bought these for my daughter, who loves them. Be aware that they are made of plastic, not metal. A great costume piece. Good quality, great price. fit good, look good. My best friend was quite happy to have received this as part of a birthday gift to help him for an upcoming steampunk-themed Halloween 2012 costume! He has been scaring his boyfriend, walking around their home wearing the goggles! Safety First! Always Wear Your Goggles! Seriously...what good Steampunk would ever be caught without their goggles? These are great quality and really look fantastic. I placed my pair on the Victorian Top Hat and they really went well together. I wore these to a recent wedding and they were the talk of the event. 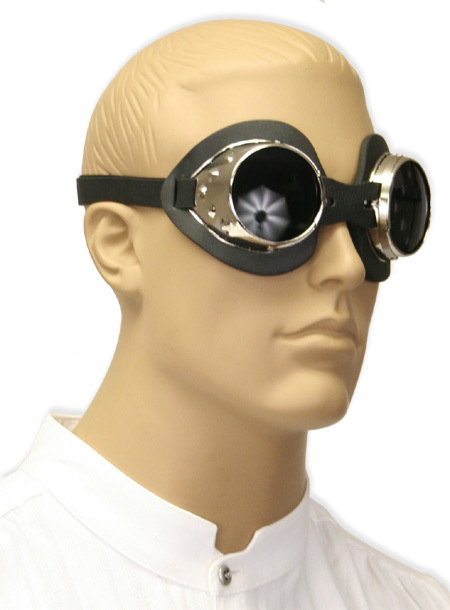 Great goggles, whether you are working hard in the lab or attending a formal gala. Awesome customer service experience and great product. Thanks! 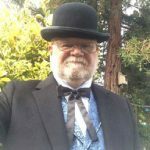 We have ordered several items of Old West clothing and the overall experience has been great. I had to exchange one item because I wasn't happy with how it fit, and it was returned promptly and without issue. Great company. Great all around experience. Great doing business!